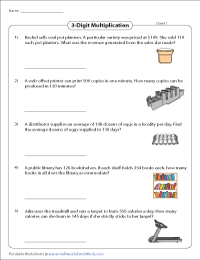 This page hosts a vast collection of multiplication word problems based on real life scenarios, practical applications, interesting facts, and vibrant themes. 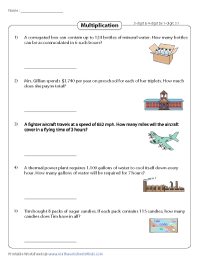 Featured here are various word problems ranging from basic single-digit multiplication to two-digit and three-digit multiplication. Another set of worksheets hone children's multiplication skill by multiplying large numbers. Free worksheets are included. 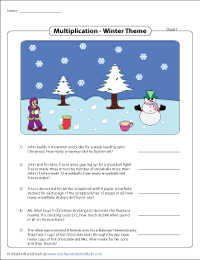 The printable PDF worksheets presented here involve single-digit multiplication word problems. 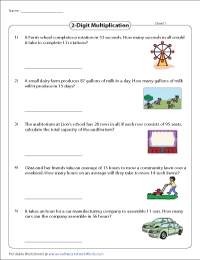 Each worksheet carries five word problems based on day-to-day scenarios. The word problems featured here require the learner to find the product by multiplying a two-digit number by a single-digit multiplier. The worksheets presented here involve multiplication of two-digit numbers. Read the word problems and find the product. Apply long multiplication (also known as column multiplication) method for easy calculation. 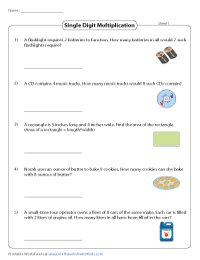 Our engaging theme worksheets help young minds understand the fundamentals of multiplication. Answer the word problems based on three fascinating themes - Winter Season, Ice rink and Library. 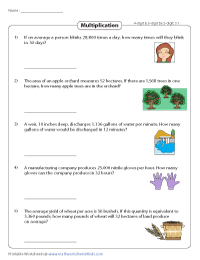 Read the word problems featured in these worksheets to find the product of three-digit and two-digit numbers. Write down your answers and use the answer key below to check if they are right. Solve these well-researched word problems that involve three-digit multiplication. Perform multiplication operation and carry over numbers carefully to find the product. The word problems featured here are based on practical applications and fact-based situations. Multiply a three or four-digit number by a single-digit multiplier to find the correct product. 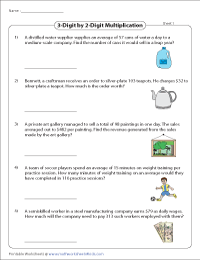 Sharpen your skills by solving these engaging multi-digit word problems. Apply long multiplication method to solve the problems. Use the answer key to check your answers.